Located in the rolling landscape of Alberta's foothills, the hamlet of Priddis sits in the heart of ranching country. Only 15 minutes from Calgary's southwest on Highway 22X, Priddis has become a popular bedroom community for commuters. Surrounded by mountain views and undisturbed wilderness, Priddis is a perfect retreat from the hustle and bustle of the city. An exclusive country-residential community on the outskirts of Calgary's deep south, Heritage Pointe offers executive and estate homes amid acres of park land and environmental preserves of the Pine Creek Valley. Magnificent homes sit on large lots within minutes from the Heritage Pointe Golf Club, providing sprawling views of the foothills and mountains to the west and Calgary's downtown to the south. Located just a few minutes south of Calgary, Norris Coulee provides country estate and luxurious acreage living just beyond the edge of the city. Quiet, peaceful and picturesque, Norris Coulee offers privacy and wide open spaces designed to immerse you in the country-living lifestyle. Located 15 minutes south of Calgary on Highway 2A, the town of Okotoks is a community with a young, energetic population that values sustainable growth, balancing environmental awareness with social and economic needs. A deeply family-centric community, Okotoks provides local, urban-styled amenities and services while providing a small-town atmosphere young and growing families love. Selling? Get a Free Foothills Home Evaluation! Question about Foothills? Give Us a Phone Call! 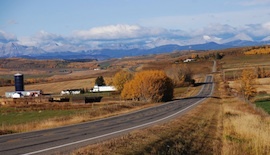 The Municipal District of Foothills is located immediately south of the city of Calgary and covers an impressive 3,600 square kilometres of southern Alberta. Known for its rolling foothills and stunning Rocky Mountain views, Foothills encompasses a diverse landscape with a mix of rural and urban communities, many with a distinctly traditional western flair. Located along 700 kilometre Cowboy Trail that stretches from Mayerthorpe to Cardston via Highway 22, Foothills has deep agricultural and ranching roots. Here where the Rocky Mountain foothills meet the grasslands was where the cowboy culture of the Alberta west evolved, a heritage which can still be seen in the local art, music, and food within the region. Working ranches and family farmsteads are still very much a part of the fabric of Foothills. Foothills provides everything a growing family needs to stay active, healthy, and happy, including some of the best schools in the Province. The Foothills School Division has a network of 27 elementary, middle and high schools throughout the region where academics, arts and athletics are balanced with technology to foster student excellence. In addition to the public system, faith-centred education is available in Foothills from the local Catholic School Division. Also available in Foothills are two well-respected public schools: Stratcona-Tweedsmuir School, providing education for students in grades one through twelve that incorporates the high-achieving International Baccalaureate curriculum; and Edison Private School that also welcomes students from grades one to twelve. Many areas both large and small in Foothills also offer local recreational facilities, parks and conservation areas, community centres, community halls, and campgrounds. Outdoor pursuits such as hiking, fishing, mountain biking, horseback riding, cross-country skiing, golfing, camping, swimming, and kayaking are popular in Foothills, and the nearby Rocky Mountains provide a wealth of possibilities for family getaways and adventures. Each community hosts its own yearly events and festivals, including fairs, rodeos, Christmas celebrations, and more.